/ I am With The Brand: The Most Branded Band. Once a turn-off, music bands are learning how to expand their fan base by reaching out to the brand they love in a consumer market where social networks and branding is a pervasive lifestyle. A big no-no until the 90′s, mega band now discover that dealing with large brand and sponsoring is one crucial step on the path to mega record contract and success. Tony Bennett, U2, The Rolling stones, Sting have gone this way. Now quickly, can you name the band that had three Â #1 hit song this year and is under contract with Samsung, Blackberry, Apple, Honda, Pepsi, Verizon and Target? The band that goes to a meeting with a power point deck and is very aware of font sizes and brand colors? 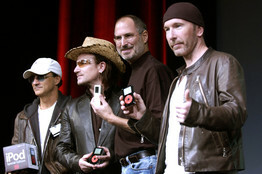 The answer is here: read that great article by John Jurgensen on the most branded band.